From September to November 2018, we traveled from the east coast to the west coast, and then back to the east coast again. That’s right. We traveled the width of the country twice in only three months and it was insane… insanely awesome. To work with one of the fastest-growing, innovative clothing companies on a promotional cross-country road trip was truly a dream being realized, and it gave us so many incredible memories. We visited 10 Duluth Trading Company stores throughout our journey: Portland, OR; Golden, CO; Omaha, NE; Duluth, MN; Mount Horeb, WI; Cleveland, OH; Columbus, OH; Pittsburgh, PA; Philadelphia, PA; and Portland, ME. You’d think that it’d be boring visiting the same type of store over and over again, but when it comes to Duluth Trading Co. stores, that’s not the case. Each store has unique features and products making every store visit a surprise. But most of all, what made each store unique were the amazing, friendly employees. Each person who works for Duluth Trading has a passion for the company, and it was so easy to see that at every store location. It made us feel that much more proud to work with them. The greatest part about this entire experience was that we got to go to so many places in the van that we hadn’t made it to yet on our own. It gave us the opportunity to explore this vast, beautiful country even more. For that, we feel so grateful. If you followed along with our journey on Instagram then you probably got a little tastes of the highs and lows we experienced. 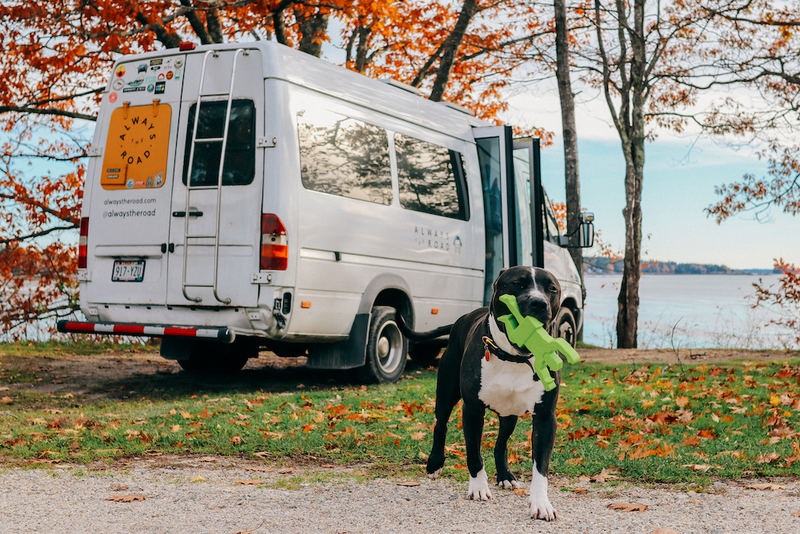 But in case you didn’t, we’re going to share some of our favorite and least favorite moments from our five-week, cross-country road trip. 1) Duluth Trading Co. store visits. While we enjoyed every store visit, we did have a couple favorites. We loved Golden because it’s by far the most beautiful location we saw. From the mountain views to the fact that when the sun set on the building it legitimately made the store look golden, to some of the most passionate managers and employees we’ve ever met, this store was more of an experience than a visit. Duluth, MN was our second favorite because it was the birthplace of the company, and holy crap is it a beautiful city! The Golden, CO store lit up by the sunset. We didn’t get to spend that much time there, but the entire three days we spent on the island were filled with lots of long hikes, encounters with bison, and watching the sunset on the sand while Snoop ran around like a puppy. 4) Old friends in new places. Another gift that this trip gave us was being able to visit old friends that have moved to different parts of the country. We got sushi with our friend, Sam, who had just moved to Portland, OR. We went to Cannon Beach, OR with our friend Mike and his pup Lilo. We went on a hike with our friend from college, Keith, in Colorado Springs, CO. We snagged some coffee with our good friend, Kathleen, from Tiny House, Tiny Footprint in Denver, CO. And we ate the best fried chicken sandwiches in the WORLD in Worcester, MA with our friend, Tom, whom we met two years prior in Joshua Tree. Snoop and Lola after a hike in CO Springs. Snoop dog takes Cannon Beach. Street side van hangs with our friend Kathleen in Denver. The icing on the cake was the grand opening of Duluth Trading Company’s Portland, ME store was truly an event to remember. There were real, professional lumberjacks that put on an incredible show, demonstrating all the different Timber Sport events in their Duluth gear. And now to the lows. Don’t worry, they’re entertaining. 1) Breaking down on the first day of our road trip. We made it as far as Bismarck, ND when our battery light came on. The next day we learned that we needed a new alternator, but they also needed to order the part. So we spent the night in the mechanic’s parking lot on our second night on the road. The best part was that it was the first week in October and a nice cold front swept in just for the day that we were stranded there, giving us 20 degree weather to sleep in. It was at that moment that Pete and I realized how grateful were were for our Duluth Trading gear! Since we don’t have a heat source in the van and we didn’t even have a heated mattress pad yet, their incredibly warm, comfortable clothing was the only reason we could have slept in the van and not have to pay for a warm hotel room. Snoop always keeps the mood light. 2) Fainting in the middle of nowhere. While Kirkham hot springs was one of our favorite stops, we had one bad experience there. After a long day of soaking in natural hot springs, not drinking enough water, and having a few beers, I stood up from our last soak too quickly and got a bad head rush. Moments later I was limp and unconscious in Pete’s arms. We had no cell service and were in the middle of nowhere, but luckily there was one other group of people at this nearly abandoned camp ground that were able to run to us and help. Where it all went down folks. 3) Breaking down for the second time. I’ll keep this brief because our van has a weird, complicated issue. Two years ago, our van shut down out of nowhere while driving the 101 in Northern California. All we did was clear the engine codes and the problem went away… until we were driving to Golden, CO for a store visit. It shut down again so we cleared the codes again and thought everything would be fine. 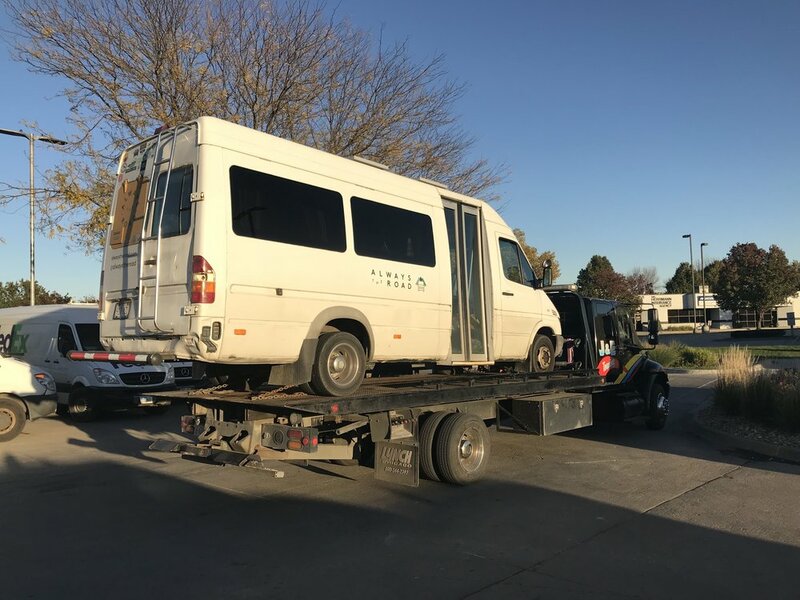 But to our misfortune it happened again in Nebraska, but this time we decided to keep the engine codes and have it towed to a Mercedes technician in Omaha. After a $600 tow and three nights in a hotel (of course we broke down on a Saturday), they told us they couldn’t find the engine codes; therefore they couldn’t diagnose the problem. So we had to just keep driving knowing that our van could shut down at any moment. So yeah, that part sucked a little. Enjoy the ride Sonder. It’s on us. Overall, this road trip was an experience unlike any other. It had its ups and downs, but our downs were really just breakdowns and that just comes with the territory. Plus, only two mechanical issues while driving across the country twice? That’s pretty damn good. Most of all we want to thank Duluth Trading Company for collaborating with us and giving us this amazing opportunity. We feel so grateful to work with such an impressive company that’s doing incredible things in its industry and in the world. The last thing we’ll leave you with are some of our personal favorite Duluth Trading Company products! Why I Love it: This lined flannel was my saving grace throughout the entire trip and still is longer after the trip has wrapped up. It’s the warmest flannel I have ever owned and I wore it at some point pretty much every day. I hiked in it, I slept in it, I shopped it in; it’s my favorite casual necessity. Why I Love it: This is the best jacket to travel in because it’s super lightweight and easy to throw in a backpack and doesn’t take up much space in the van unlike most coats, yet it’s incredibly warm! Why I Love it: To this day, these are the only jeans that I can wear without a belt. They’re flexible, warm, comfortable, and I love how they look! These have become the new staple in my jean collection. Why I Love Them: Every woman knows they’ve struck gold when they find a good pair of thick leggings that don’t stretch out! I have four pairs of these leggings myself, and the NoGA Stretch Jacket is my favorite thing to pair with them! Why I love it: Wearing this fleece jacket is the equivalent of getting hugged by a bear. Not only is it extremely comfortable and soft, it’s also crazy warm. I wore this most mornings as I rolled out of bed in 30 degree temperatures. This is a must have for cold weather. Why I love it: I’m already a sucker for down jackets so this was an easy pick for me. It’s lightweight, water repellent, and flexible, making it my go to jacket for adventuring on cold days. Also, did I mention that I’ve slept in this multiple nights when temperatures dropped into the 20’s? Why I love it: Duluth Trading Company makes the best flannels in the world. There’s no question about it. The reason I specifically like their burlyweight flannels so much is because of their thickness and durability. They’re the perfect flannels for casual get togethers or long work days…or both! Why I love it: If I’m being completely honest, I’m just a huge fan of how this sweater looks. That’s what initially drew me to it but what keeps me wearing it is how comfortable and warm it is. It’s made of soft Shetland wool and has an inner lining that acts as beastly windbreaker. Why I love it: If you see me heading to a coffee shop or business meeting, there’s a 100% chance that you’ll see me carrying this briefcase. Not only is it the ideal carrying case for my laptop, notebooks, and books, it’s made from premium grade full-grain cowhide leather, meaning it’s extremely high quality and durable.